In the spring of 2014, I took “Archetypal Psychology” with Heather Wulfers at Southwestern College. I was a bit intimidated about taking this class. Of all the classes I’d taken at Southwestern, this was the subject I’d had the least experience with, and I wasn’t sure exactly what to expect. I had a feeling this class would stretch me, and I wasn’t sure whether I was up to the challenge. Archetypal Psychology ended up being one of my favorite classes. Each week, we would each create a mandala drawing and share it with the class. I’d like to share a few of my drawings with you, to give you a taste of what this class was like for me. I created my first mandala of the quarter on the first day of class, after a “color breathing” meditation. 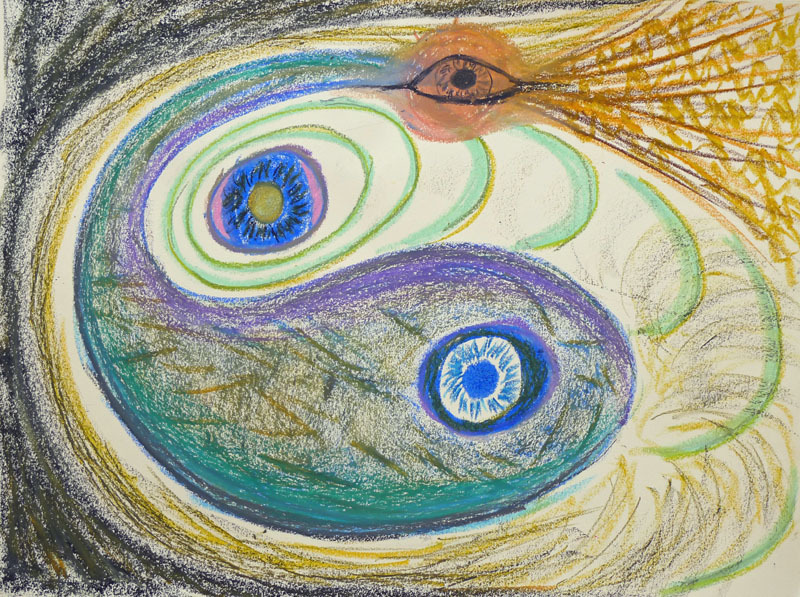 During the meditation, a Y-shaped image appeared in my mind’s eye. After the meditation, I had a sense of myself at the center of the Y, collecting spiritual energy from above and transforming it into diverse creative forms below; this became the basic concept and structure for the mandala. Two ongoing themes in my life this quarter were 1) the development of my intuitive, imaginal, soul-focused, right-brain-focused modes of creativity and perception, and 2) the integration of these modes with the intellectual, conceptual, left-brain-focused modes that are more familiar to me. These themes are apparent in my process of creating this first mandala and in its structure: the image of the Y appeared spontaneously during a meditative process; I used imaginal perception to sense its deeper meaning; I used a more conceptually-based creative process to translate that meaning into the initial visual “vocabulary” that I used in the image (the circle representing myself, the color spectrum above representing pure spiritual energy, and the shapes below representing diverse creative output); I outlined this basic structure on paper; then I shifted back into a more right-brain-focused creative process to flesh out the drawing, letting my hands move fairly spontaneously as I selected colors and drew forms (without “thinking about it” too much). I initially planned that the areas on the left and right sides of the image would be black; however, I had trouble achieving a uniformly-flat black color with my oil pastels. At first, I tried a left-brain-focused strategy of evening out the variations and imperfections within the black areas, but this didn’t work very well. Soon, I was surprised and delighted to discover that I was actually fascinated by these variations and imperfections; instead of evening these out, I decided to accentuate them, letting them take on forms of their own. 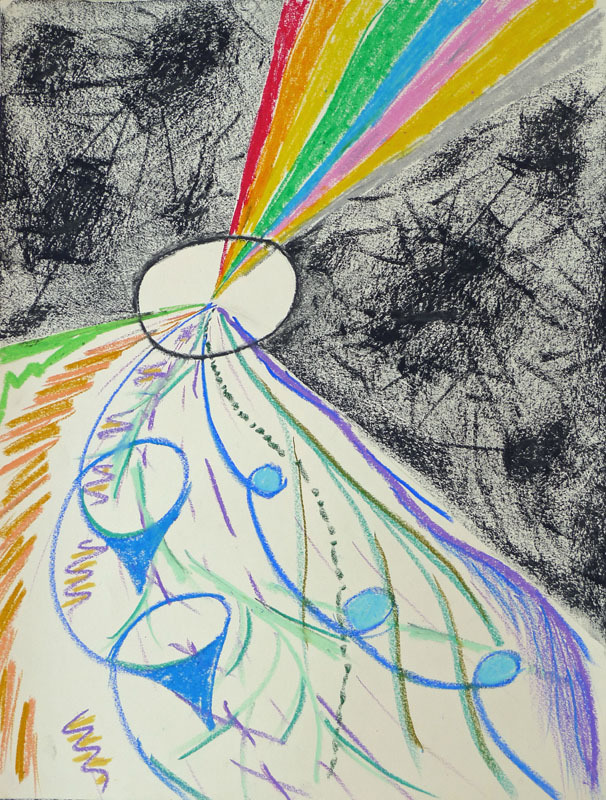 As I shifted back to an imaginal mode of perception and a spontaneous mode of creativity, faces started appearing in the blackness, then lines appeared connecting the faces. There seemed to be a vast, dense network of interconnected beings in this blackness. I started getting a sense of myself as both the clear white light in the center of the circle, as well as the mysterious, unknown shapes and forms in the blackness outside—with the edge of the circle representing the dividing line between the conscious and the unconscious. I was quite pleased with my process of creating this mandala and with the visual result. I believe this satisfaction reflected the integration I experienced by allowing an interplay of left- and right-brain-focused modes of perception and creativity throughout this process. 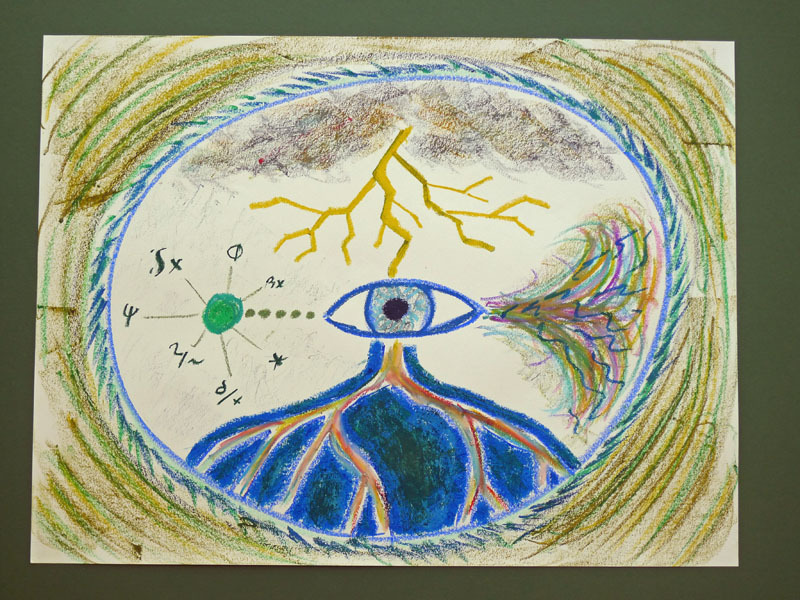 It seems to me that this type of integration is a worthy goal of art-focused counseling—and that achieving this goal depends on the therapist’s ability to facilitate the interplay of left- and right-brain-focused modes. For this mandala, I chose a theme that was very much alive for me: the idea of “letting go” and shifting toward a more receptive, “yin” state of mind. Before I started drawing, an image of a dark yin symbol came to mind; I used this as a starting point for the drawing. After that, I let my hands select colors and draw forms spontaneously, without much conscious planning. When I was done with the drawing, I lightheartedly judged it to be the ugliest drawing I had done so far this quarter; however, when I looked at it later, in class, I found myself quite pleased with its qualities of energy, movement, and aliveness. Feeling into its deeper meaning, I have a numinous (and perhaps somewhat ominous) sense of communication from the depths, accompanied by sound, form, and awakenings of awareness. This is one of my favorite mandalas of the quarter. I used an iterative sketching approach to plan the structure of my final two mandalas (“character” and “curriculum” mandalas). I’m quite pleased with both these mandalas. They draw heavily on the symbolic language that I developed during the quarter. They each represent conceptual understandings that I was aware of before I started drawing—but I allowed myself to be fairly spontaneous in choice of color and line, and I believe this allows an energetic sense of mystery to shine through them and enliven them. 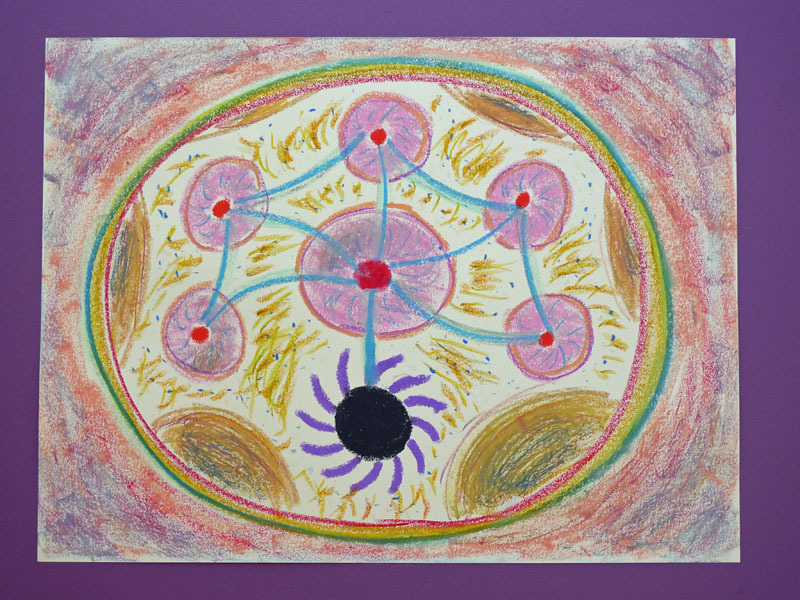 It’s as if the soul is resonating with truths about myself (expressed in the character mandala) and a vision for my future (expressed in the curriculum mandala). I believe my spontaneity in choice of color and line created space for this “soul resonance” to enliven the images. To learn more about me and what I’m up to, please visit my website.